VTT-EC100 Mini Size TT Table. 18 MM Thick Pre-Laminated Particle Board, Includes in package: TT Table, TT Net and Net Stand and a Installation Manual. 18 mm thick pre-laminated particle board 25 mm round pipe legs. Easy to assemble and store. 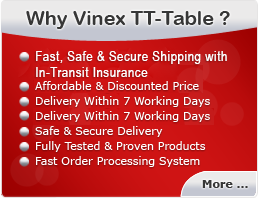 Includes in package - TT Table, TT Net and Net Stand and a Installation Manual.